The deep web is the part of the internet that is not indexed by search engines. A part of the deep web is the dark web, which exists inside layered proxy networks, so-called darknets. Of these dark nets, Tor is by far the largest. The suffix of its native domains, .onion, has become synonymous with internet freedom. This article can also be found on the dark web! Get the Tor browser and go to http://expressobutiolem.onion/blog/best-onion-sites-on-dark-web/. The first online publication that won a Pulitzer is now also the first major publication with a .onion address. ProPublica does a lot of things differently. Its source of funding is the deep wallet of the Sandler Foundation and various other similar organizations. 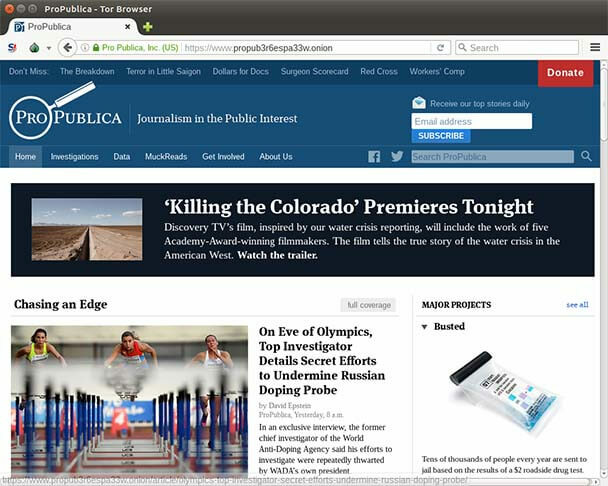 Browsing the ProPublica website through their .onion site works well and is a big win for privacy and free speech. Why would one of the largest organizations known for its invasive stance on privacy and controversial clear-name policy have a .onion address? While Facebook might collect everything you say and do on its platform, it isn’t happy with sharing this information with others. Facebook is also keenly aware of attempts by many governments to restrict access to a tool that allows strangers across the web to engage in discourse and collaborate freely. 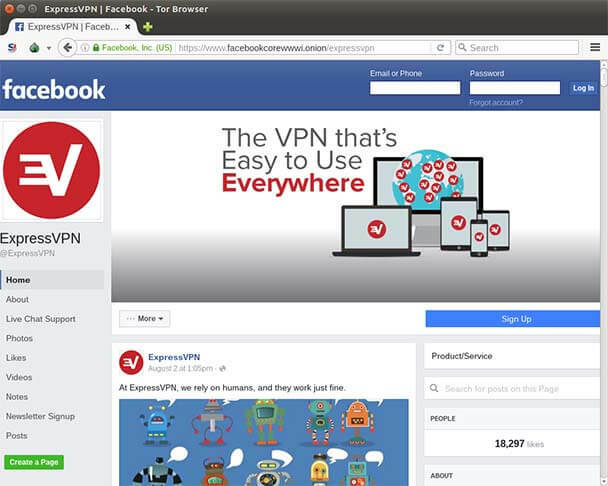 Facebook’s .onion address doesn’t make it much easier to maintain an anonymous account, but it does make Facebook more accessible in places where it’s censored. Searching for content but don’t want to give up your privacy? 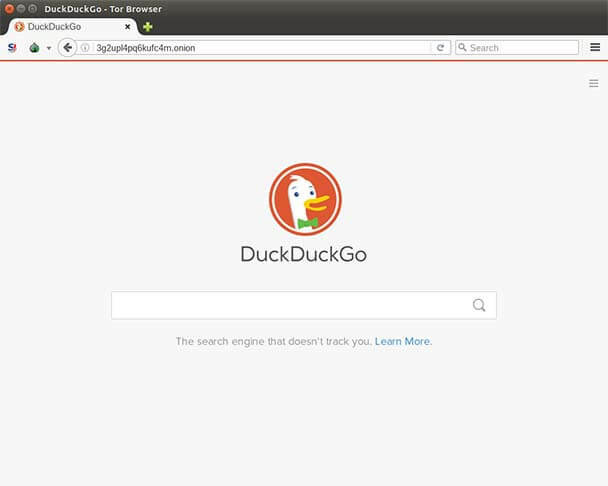 DuckDuckGo is a great alternative to Google. Search activity isn’t logged by design. Even without the ability to learn about your behavior or monitor your email and browsing, DuckDuckGo provides decent results. Which begs the question: Are Google’s extensive surveillance techniques really necessary? Over Tor, Google becomes annoying to use due to its many captchas, while The Duck excels at speed, reliability, and privacy. 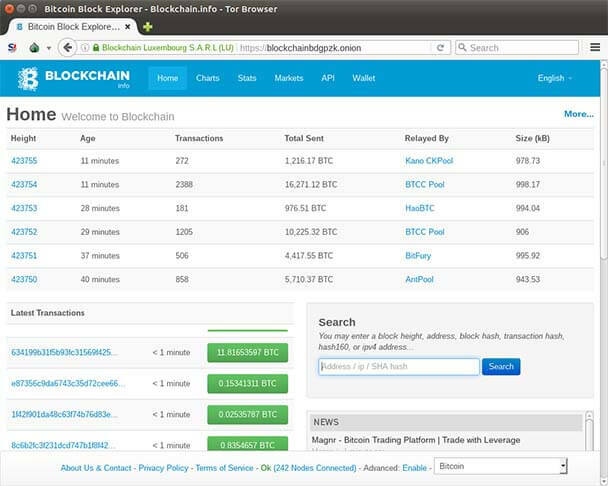 Need to hold your Bitcoins anonymously? The world’s most popular online Bitcoin wallet is also reachable via a .onion address and together with Facebook, ProPublica, and the Intercept is among the only sites with HTTPS certification for their .onion address. 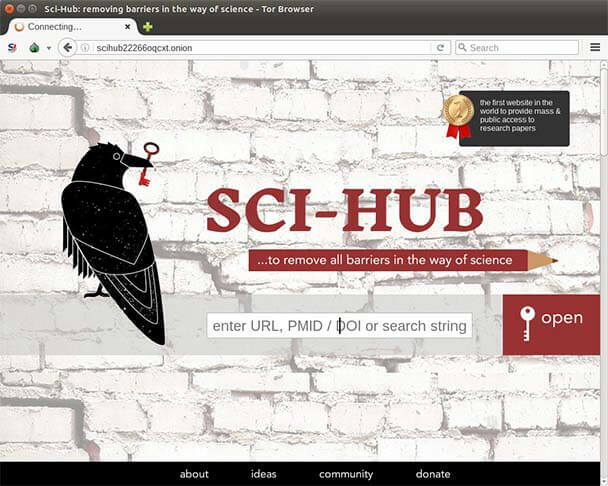 Sci-Hub is a platform that aims to liberate the world’s scientific knowledge. Want to securely leak information about the UK police to a reputable police monitoring organization? 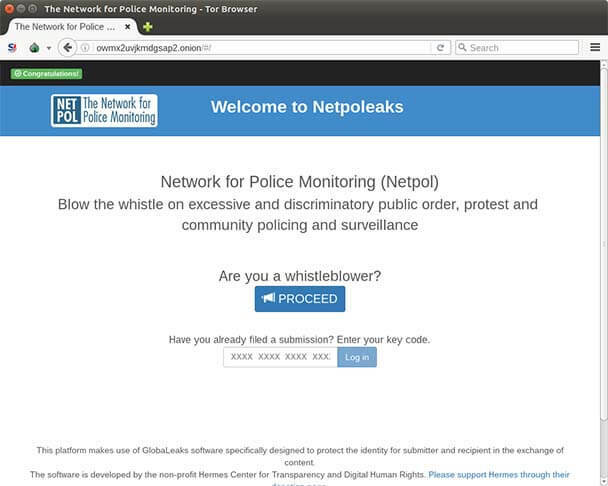 Netpoleaks lets you upload information and files anonymously to their web server. Once submitted, you’ll receive a receipt in the form of a key code which you can later use to communicate securely with the site’s operators. Are you sitting on a great story and need to share it anonymously with the team from the Intercept? 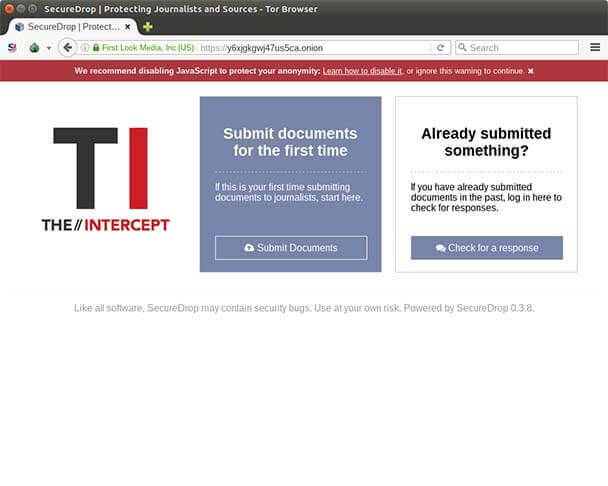 Their SecureDrop installation is one of only a few .onion sites with a TLS certificate, further underscoring the Intercept’s strong stance on privacy and solid dedication to helping whistleblowers worldwide. 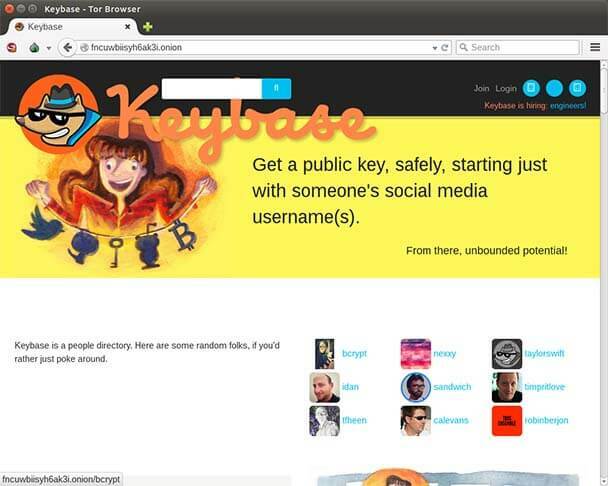 Keybase is an exciting identity service that aims to make it easy for you to link the presences of your online identity together in a cryptographic way. You can upload your PGP key, or have the site create one for you, and use it to cryptographically link your Twitter profile, Github account, or Bitcoin address together. Keybase significantly raises the bar for attackers who want to impersonate you. How do you discover content where search engines cannot reach? 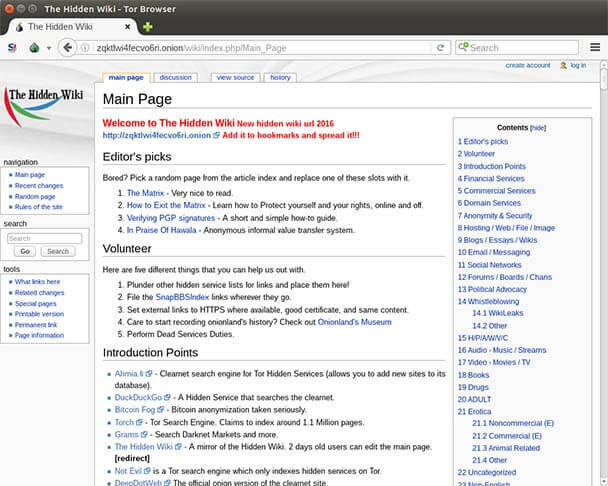 Just like in the old days of the internet, the dark web maintains numerous indexes of sites, like The Hidden Wiki. This community-edited wiki contains a bunch of links to a wide variety of services and sources running on the dark web. Many of those links are defunct, and even more of them link to scams or potentially illegal activities. Click with caution! The wiki also has articles and guides, conspiracy theories, and a short chronology of the dark web’s history.